The Dodos know something about push and pull. They come at you viciously, screaming guitars and rushed pacing, tying your heart in knots. Then they withdraw, gently floating into acoustic wonderment, a fragile and vulnerable state. It's tension, it's unease, it's bliss, it's joy. 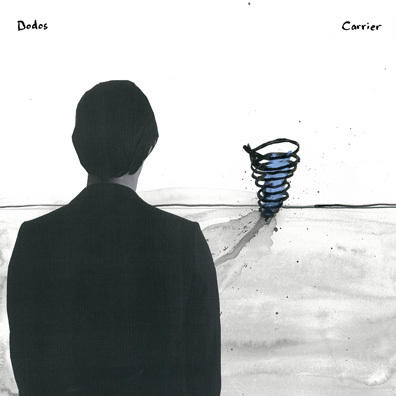 Carrier is a transitional album for the band, who lost guitarist Chris Reimer last year when he unexpectedly passed away from a heart condition. The two remaining members, Meric Long (vocals, guitar) and Logan Kroeber (percussion), carry on his legacy by making a bold album that takes you places. The best songs are slightly off. "The Carrier" begins with two guitar parts playing in unison, slightly discordant. In come the percussion and a third guitar part, and this imperfect collision of sounds is just right. The result is menacing, intense, and the rare piece of music that is still mysterious after several listens. The Majik Majik Orchestra, who have loaned themselves to past John Vanderslice recordings, contribute to several songs on Carrier, further fleshing out the band's sound. A horn section rounds out the climax of "Substance," making it something truly grand. Lucky for us, The Dodos then let the song wander off into a hazy acoustic retreat for one final minute of guitar picking so sweet it rivals German chocolate cake.